While Taurus star sign takes their time to do anything, Uranus in Taurus has the energy to get up and get moving. Once they’ve made up their mind there’s no stopping the things they set in motion. They have a goal and a plan on how to reach it, and they do. Uranus in astrology symbolizes revolution, rebellion, life-changing innovations and new technology (See Uranus symbolism). 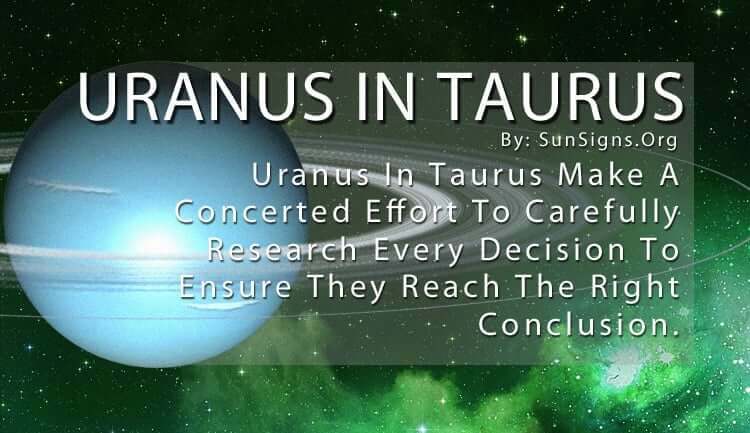 Uranus in Taurus makes a concerted effort to carefully research every decision and every project to ensure they reach the right conclusion. This ability to build off past information helps them to create new possibilities. Another thing Uranus in Taurus appreciates is beauty, and it’s their well-trained aesthetic eye that helps with their innovations. (planet Venus is the ruler of this star sign). As an earth sign, they are preoccupied with the physical realm and are quite talented at using whatever they have at their disposal. They are usually good with their hands and they enjoy constructing things from scratch. Their energy comes from their desire to create something brand new and they take pride in adding something beautiful or useful to the world. Uranus in Taurus works very well in a group, as long as the group has a shared goal and agrees to the same plan. They are a team player when everyone is on the same page. If someone questions their methods their stubborn personality will come through, and they will not engage with the other person. But while they are incredibly patient, they do have their limit like everyone else. If pushed too far you’ll see their bullish temper come out, and no one wants to see that! It’s better to trust the instincts of Uranus in Taurus because they have looked at the problem from every possible angle. The Uranus in Taurus is practical in their approach and meticulous in their calculations, which is why they appear to be moving slower than others. But once they set things in motion you will be able to see the brilliance of their actions. Good things come to those who wait, and Uranus in Taurus always delivers. Even when they become excited about an idea, they don’t allow their enthusiasm to get in the way of completing a project as efficiently as possible. This is also why they are good with new technologies. They appreciate anything that helps to do things easier and are always looking for the next machine or process to do just that.